Take Route 17/Interstate 86 West to Exit 56 in the City of Elmira. Make a left at the end of the exit ramp onto Water Street. Follow Water Street past the Holiday Inn to the first light. Make a left at the first light onto Madison Avenue. Follow Madison Avenue over the bridge to the first light. Make a left at the first light onto Maple Avenue. 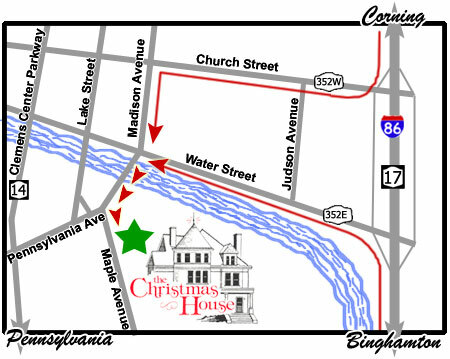 The Christmas House is the 2nd house on your left. Take Route 17/Interstate 86 East to Exit 56 in the City of Elmira. Make a right at the end of the exit ramp onto Church Street. At the third light, just past St. Joseph’s Hospital, make a left onto Madison Avenue. Follow Madison Avenue through two lights and over the bridge. At the next light, make a left onto Maple Avenue. Follow Route 14 North to the City of Elmira or Route 328 to Route 14 North. In the City of Elmira, Route 14 becomes the Clemens Center Parkway. Follow the Clemens Center Parkway through several lights to Pennsylvania Avenue. Make a right onto Pennsylvania Avenue. Make a right at the second light onto Maple Avenue.